Click on a section to reveal more detail. 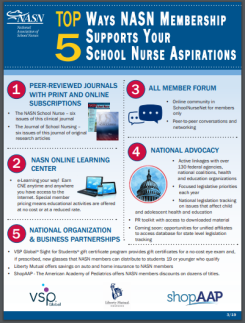 The All Member Forum on SchoolNurseNet connects all of NASN's members into one private and professional online community. Each weekday, NASN members receive a summary of discussions from the previous day. Members ask questions, share information or just read what others are saying. The NASN Annual Conference happens every summer at various locations around the continental U.S. NASN members pay a special member rate to register and have reserved seating at the annual business meeting. New members licensed as a registered nurse are automatically entered into a random drawing where one eligible member receives a scholarship to attend! Most of NASN's members have a combined or unified membership with NASN and the NASN affiliate in the member's state or area. NASN affiliates have their own board of directors, website and business and educational meetings. NASN Affiliates may also have an online community or discussion list, newsletter, and/or other resources available to members. NASN has four special interest groups (SIGs): Consortium of School Nurse Educators; Private, Independent, and Parochial School Nurses; School Nurse Administrators; and Special Needs School Nurses. NASN members are eligible to enroll in any SIG at any time. Each SIG has a leadership group, a private online community and hosts a meeting at the NASN Annual Conference. The NASN Strong member-to-member initiative rewards NASN members for their influence. Each new member referral earns NASN member a $10 e-commerce credit that can be used towards dues renewal payments, NASN conference registrations, or online bookstore purchases. The Journal of School Nursing (JOSN) is a peer-reviewed journal published in February, April, June, August, October, and December. It features original research articles. NASN members receive a print and online subscription to this journal. The NASN School Nurse is the official clinical journal of NASN and is published in January, March, May, July, September, and November. NASN members receive a print and online subscription to this journal. The NASN Weekly Digest is NASN's e-news communication. It is published weekly and contains updates about NASN, its partners, and other school nursing related news items. NASN members are added to the subscription list on a monthly basis. NASN members are kept informed by email of important events and programs at NASN including the annual conference, school nurse day, the biannual school nurse survey, and more. VSP Vision Care's Sight for Students program is open to NASN members. Through this partnership, NASN members receive gift certificates they can share with qualifying students 19 years of age or younger. The best professional liability rates available are extended to NASN members through NASN's partnership with Lockton Affinity. The UnaRxCard is a discount prescription drug card that can lower the cost of many prescription medications and things like diabetes supplies, hearing aides and glasses. The card is available to NASN members and can be shared with others including students and their families. Online continuing nursing education in the NASN Learning Center is always discounted for NASN members. In many cases, the activities are free of charge to NASN members. Titles in the NASN Bookstore including ebooks and manuals are always discounted for NASN members. The Endowment Education Scholarship provides funding annually to one or more qualifying NASN members pursuing post baccalaureate certification or graduate degrees. The RN to BSN Education Advancement Scholarship provides funding annually to one qualifying NASN member who is pursuing a bachelor of science in nursing degree. Research Grants fund qualifying research projects annually. Eligible projects must include a member of NASN on the research team. NASN and the American Nurses Foundation fund a qualifying research study annually. The eligible awardee must be a member of NASN. The Advocacy Education Scholarship provides funding annually to one qualifying NASN member participating in an advocacy education program. The annual trip to Capitol Hill is attended by NASN Directors representing NASN affiliates. This event is how NASN shares its legislative priorities with the U.S. Congress. Directors receive training and guidance in preparation of this event. The NASN Employment Center provides a list of jobs posted with NASN and other job boards. It has career resources like tips for resume writing. NASN members receive a list of new jobs in an email every two weeks.